A few weeks ago I had the pleasure of attending a lunch thrown by Claudia Mahecha and Robert Allen, in celebration of the opening of their new Potrero Hill design showroom Supernatural. After wandering through the minimalist, beautifully curated 2,000-square-foot space—a showroom that spotlights hard-to-find European design and doubles as the home base for Mahecha's interior design firm, Claudia Mahecha Design—the guests (editors, artists, restaurant owners, designers) all sat around a big oak table topped with a Hella Jongerius table runner, and over lunch traded gossip and news about the San Francisco design and art worlds. Here's a peek at the space. All photos by Devon Elizabeth Butler. 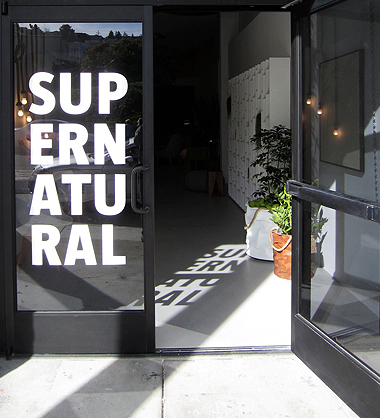 Supernatural's graphic logo features prominently on their front door. A view of the showroom, including the Yale Sofa by MDF Italia, on the left, the Legno Vivo Cedar small table collection by Riva 1920, the Farah sideboard in oiled European walnut with brushed stainless steel frame by e15, and the Eugene lounge chair designed by Stefan Diez for e15. The showroom currently features work by Debra Oropallo, a Bay Area-based artist represented by Stephen Wirtz Gallery and Gallery 16. This piece, a digital pigment print and acrylic on canvas, is titled "Rapunzel." The eight-foot-high live vertical moss wall is a bright backdrop for the Yale sofa. On the left is the Zehn table in oiled European oak by Phillip Mainzer for e15, lit by "Lanterna" hanging light fixtures by Oluce. The dining chairs are "Houdini" side chairs with upholstered seats by Stefan Diez for e15. The showroom's side back wall spotlights a Sipario system in American walnut by RIVA 1920 and an "O' Sole Mio" standing light fixture by Catellani and Smith. A close-up of Flax light grouping by Christien Meindertsma. A Fil de Fer pendant light fixture by Catellani and Smith hangs over a S-Table in matte white resin by MDF Italia, surrounded by glossy Flow chairs. Along the wall is the Centopercento closet system by Tisettanta.